On March 22, 2014, at approximately 12:30 pm, the 585 foot bulk carrier M/V Summer Wind collided with the oil tank-barge Kirby 27706. The incident occurred in Galveston Bay near Texas City, Texas. 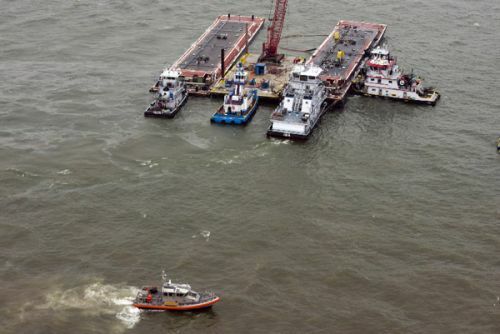 The barge contained approximately 1,000,000 gallons of intermediate fuel oil in multiple tanks. The #2 starboard tank was punctured, spilling approximately 168,000 gallons of oil. The barge is now aground and the remaining oil was lightered (removed) late Sunday. The M/V Summer Wind is stable and not leaking oil. As of March 23, the Houston Ship Channel and Intracoastal Waterway was closed to traffic, including ferries and cruise ships. U.S. Coast Guard, NOAA, U.S. Fish and Wildlife Service, the Texas General Land Office and other agencies are responding. NOAA is providing scientific support to the U.S. Coast Guard, including forecasts of the floating oil movement, shoreline assessment, information management, overflight tracking of the oil, weather forecasts, and natural and economic resources at risk. Marine mammal and turtle stranding network personnel are also standing by. The NOAA Weather Service Incident Meteorologist is on-scene, as are additional NOAA personnel. Natural resource damage assessment personnel will be at Galveston Bay to initiate studies that could be used to identify injured resource and restoration needs. IFO-380 will usually spread into thick slicks which can contain large amounts of oil. Oil recovery by skimmers and vacuum pumps can be very effective, particularly early in the spill. Very little of this is likely to mix into the water column. It can form thick streamers or, under strong wind conditions, break into patches and tarballs. IFO-380 is a persistent oil; only a relatively small amount is expected to evaporate within the first hours of a spill. Thus, spilled oil can be carried long distances by winds and currents. IFO-380 can be very viscous and sticky, meaning that stranded oil tends to remain on the surface rather than penetrate sediments. Light accumulations usually form a “bath-tub ring” at the high-water line; heavy accumulations can pool on the surface. Floating oil could potentially sink once it strands on the shoreline, picks up sediment, and then is eroded by wave action. The incident occurred just inside the entrance of Galveston Bay. Northeasterly winds are expected to carry the oil out of the Bay, but onshore winds expected midweek could bring the oil back along the ocean beaches. 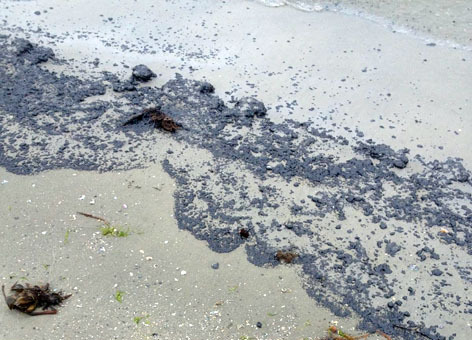 The oil, likely in the form of tarballs, could be spread over a large section of ocean beaches.